When it comes to Wakefield’s prominent old families, chances are you’ve at least heard of the Hartshornes, the Beebes, the Wakefields and the Eatons. But what do you know about the Walton family of Wakefield, Massachusetts? There are three streets, a school, a field and an entire block in Wakefield Square that bear the name Walton, and yet, as Walton Lane resident Brian Coughlin points out, the vast majority of people in town probably don’t know much about this once prominent and influential Wakefield family. Coughlin decided to find out who his street was named after. He wound up with a thick folder of news clippings from the New York Times, the Boston Globe and the Wakefield Daily Item that told the story of payroll heists, union strife, arson and Walton family connections to Yale University, Major League Baseball and Hollywood. “It has all the elements of a compelling miniseries,” Coughlin says. To say that the Waltons at one time owned half of Wakefield would be an exaggeration – although it would not be much of one. When the Waltons’ Lakeside estate overlooking Lake Quannapowitt was sold to a developer in 1938 for pennies on the dollar, the Daily Item called it “one of the biggest real estate transactions ever taking place in Wakefield.” On top of that, the Walton family once owned a large chunk of downtown Wakefield as well as extensive property on the West Side. 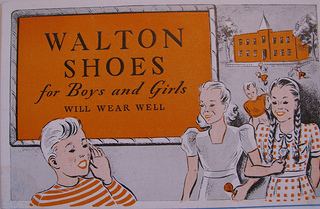 Until 1951, the A.G. Walton Co. in Chelsea was one of the largest manufacturers of children’s shoes in the United States. The firm’s principal owner, Arthur G. Walton, was born in 1855, the son of Daniel Gould Walton and Elizabeth Jeanette (Aborn) Walton. Arthur G. Walton could trace his family back 300 years to Wakefield’s earliest settlers. Arthur graduated from Wakefield High School in 1871. In 1881, he married Mary E. Bartlett. After working briefly in the chemical dye business and the rubber business, he became a partner in the Lynn shoe manufacturing company of Walton and Logan. 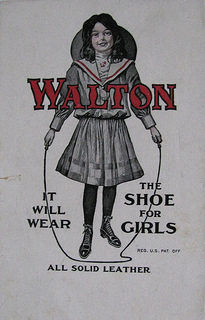 Walton later broke off to form the A.G. Walton Co. of Chelsea. It was the Golden Age of American manufacturing. 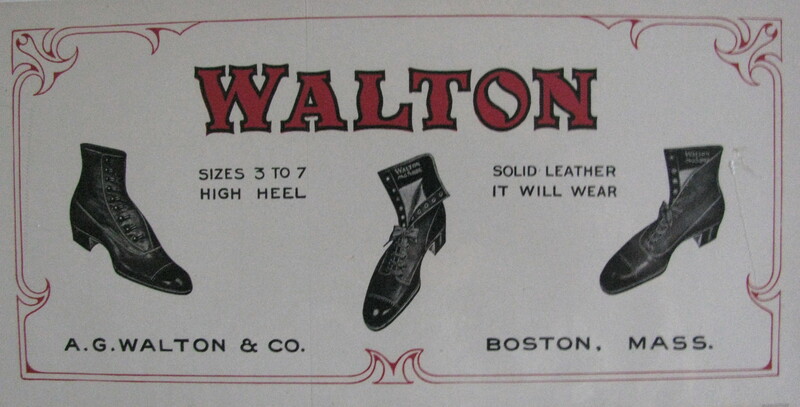 The Walton factory used a freight car load of sole leather each day and turned out 12,000 pairs of shoes every day of the year, according to the Chelsea Record. Not only that, the Walton plant was a model of industrial self-sufficiency. The company generated its own power and lights, maintained its own machine shop and carpentry shop, and operated a complete printing plant for its catalogs and advertising. Like most workers in the early part of the 20th century, the more than 1,800 employees at Walton’s plant in Chelsea were still being paid in cash. And so at 9:15 a.m. on Nov. 26, 1921, the Walton plant fell victim to a daring payroll robbery that, despite its lack of fatality, the New York Times said “in many respects duplicated the Sacco-Vanzetti payroll robbery at South Braintree” the previous year. When the messengers from the First National Bank of Boston exited their truck and started for the factory entrance with the payroll, four bandits closed in and opened fire. At least a dozen shots were fired, according to the Times, by the robbers, by the guard that accompanied the bank messengers and by the driver of the bank car. One of the robbers was hit, but he was dragged into the robbers’ getaway car by one of his associates. The crooks took off at a high rate of speed with the entire A.G. Walton payroll. Not only did the company lose its weekly payroll, Arthur G. Walton came close to losing his life. During the shootout and robbery Walton was in the office of the company’s assistant treasurer Harry Foster (who also happened to live in Wakefield, at 25 Avon St.). “I am generally in Mr. Foster’s office about that time every morning,” Walton later told the Daily Item. The windows of Foster’s office, Walton explained, overlooked the street and both men noticed and casually remarked on the arrival of the bank’s payroll truck. Moments later, Walton told the Item, they heard popping sounds. “Both of us thought it was some automobile backfiring,” Walton recalled. They went to the window to look. “It was the first time in my life I ever saw men shooting at each other,” Walton said. In the midst of the morning’s chaos, the company’s switchboard operator, Mrs. Minnie Kerwin of Everett, ignored her employer’s orders to take cover and called the Chelsea Police, according to the Boston Globe report. With the memory of the Sacco and Vanzetti robbery still fresh, law enforcement quickly fanned out across the state and beyond in an effort to apprehend the culprits. Just two days later, on Monday, Nov. 28, 1921, police arrested the driver of the robbery car, James Luna, 24, in a boarding house in South Boston, according to a story in the Nov. 28, 1921 Boston Globe. Acting on information obtained from Luna, police then went to a home in Everett where they nabbed John Dubok, 31. In Dubok’s room, cops found a bag with over $20,000 of the stolen Walton payroll money. The Globe said that both men were immigrants from Poland. A third robber, John Pietkewicz, 17, was on a train to Detroit when he spilled his guts to two men, thinking that they were detectives who were on to him. They weren’t cops, but they did turn him in to the police at the train’s next stop. Walton later recalled his reaction on the day of the daring robbery. “It seemed as much like a scene in the movies as anything I can think of,” he told the Daily Item. Business as usual. lol Love this! Who knew? Thank you for putting this all together. Helen Moss Ogden (great-granddaughter of A.G.Walton) My mother was the older sister of Mary Walton Giamatti. Can you post a photo of the box? I had read your article when it was published a few years back, and have just came across this online article. My Home on Park Ave was owned by The Walton Family for over 70 years. 7 members of the Walton family now in their 80s paid us a visit 10 years ago. They brought along a wonderful binder with great pictures and many interesting articles ( one article, was a copy of the newspaper clipping on the payroll robbery ) , that they left as a gift for us. Thay also shared many memories as well. This home was the birthplace of Mary Walton, whose son was Bart Giamatti. Bart Giamatti, became President of Yale University and later MLB commissioner. Bart was the commissioner of MLB when Pete Rose was suspended for Life. If you intend to do any follow-up articles on the Walton family ( once the kiosk chaos settles down ) I’d be glad to provide you the binder that was gifted to us. Thanks Rod. I remember that you emailed me about this when the series first came out. If I ever do any more with it, I’ll keep your offer in mind.